Mania with psychotic features is one of the common presenting clusters of psychiatric symptoms in HIV-infected patients. Commonly, patients with HIV-associated mania receive antiretroviral treatment, mood stabilisers and antipsychotics. This case of Stevens-Johnson syndrome highlights the dilemmas and complications that may arise when prescribing multiple medications in HIV-associated psychiatric disorders. HIV enters the central nervous system early in the course of HIV infection and causes a range of neuropsychiatric complications, including HIV encephalopathy, depression, mania, cognitive disorders and frank dementia. Mania is one of the most common psychiatric presentations in HIV-infected patients and requires antiretroviral therapy (ART), mood stabilisers and antipsychotics to increase patient quality of life and decrease mortality. [1-3] ART may also protect from further cognitive deterioration and preserve functionality. The link between systemic hypersensitivity reactions and nevirapine has been well documented. Case reports have also demonstrated adverse cutaneous reactions associated with the use of sodium valproate and risperidone. [5,6] This report describes the case of an HIV-seropositive patient who presented with mania for the first time and was treated with nevirapine, sodium valproate and risperidone. He developed Stevens-Johnson syndrome (SJS), which progressed to toxic epidermal necrolysis (TEN) and death over a period of 26 days. 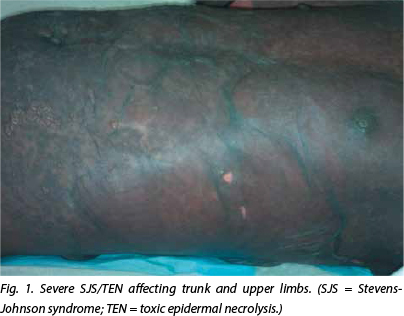 SJS/TEN comprises cutaneous adverse reactions ranging from mild erythematous macules to extensive epidermal detachment and mucous membrane erosion. The international classification of SJS/TEN is based on the body surface area (BSA) involved: SJS involves <10% of BSA; TEN involves >30%; and there is an overlap in definitions with involvement of 10 - 30%. Mortality associated with SJS, SJS/TEN and TEN is 10%, 30% and >50%, respectively. Common causes of death include septic shock, hypovolaemic shock, acute renal failure and fulminant hepatitis. The most common drugs implicated are sulphonamide antibiotics (38%) and nevirapine (20%). An immunological response involving CD8+ T lymphocytes is the most likely explanation for the pathogenesis of SJS/TEN. Other potential factors are the causative drug's inherent properties or chemical structure, patient factors such as HIV status and CD4+ count, ethnic background, age and gender. Affected individuals with SJS/TEN are genetically predisposed to developing severe cutaneous reactions based on the major histocompatibility complex molecules on their leukocyte cell surface. A study in Taiwan showed that 100% of Han Chinese patients who developed SJS in response to carbamazepine had an HLA B*1502 allele. Comorbidity of SJS/TEN and HIV is posing a challenge in sub-Saharan Africa due to the high prevalence of HIV. In this setting, sulphonamides and nevirapine are the most commonly implicated drugs. A 28-year-old man was referred to the mental health unit (MHU) with a 3-week history of manic symptoms, presenting for the first time. He was irritable, displayed pressure of speech, and had decreased need for sleep, increased drive, hyper-religiosity, impulsivity (reckless spending of money) and auditory hallucinations. He tested positive for HIV and syphilis (rapid plasma rea-gin (RPR) titre of 1:8). His CD4+ count was 334 cells/µl and he was not on ART. Cerebrospinal fluid analysis was negative for neurosyphilis. Chest X-ray and GeneXpert on sputum excluded tuberculosis. Treatment initiated on admission was 3 mg risperi-done daily, 500 mg sodium valproate twice daily and penicillin. On day 3 after admission, he was prescribed 300 mg zidovudine twice daily, 150 mg lamivudine twice daily and 200 mg nevirapine daily. The nevirapine dose was to be doubled to 200 mg twice daily after 14 days. His psychiatric symptoms responded well to treatment and he was discharged on day 8 post admission. On day 7 he had complained of a mild rash on his hands and nevirapine was suspected as the cause. ART was continued, and 4 mg chlorphenamine three times daily and hydrocortisone 1% cream were prescribed. Review at follow-up on day 3 and day 6 post discharge revealed that the rash had settled and he remained physically and mentally well. The nevirapine dose was increased, as per treatment plan, on day 10 post discharge. He presented at his next review appointment on day 13 post discharge with a severe SJS/TEN reaction (Fig. 1), which had developed on day 10 post discharge, coinciding with the increase in nevirapine. He had continued his treatment and had waited for his next follow-up appointment before reporting the rash. He was re-admitted to the intensive care unit where his condition deteriorated, with death occurring on day 6 of his second admission. Death was thought to be related to infection and renal failure. The patient was initiated on ART while admitted to the MHU, which is common in our setting and other parts of South Africa (SA) as ART initiation may help to ameliorate HIV-associated neuropsychiatric symptoms and potentially improve cognitive function in particular. In this case, the choice of ART regimen was influenced by a number of factors, including the safety profile of both efavirenz and nevirapine, the risk of ART-induced neuropsychiatric side-effects (more commonly seen with efavirenz), the patient's wishes, informed consent given for further management of his condition, the applicable World Health Organization staging and the latest SA National Department of Health ART guidelines. The fatal outcome raises questions regarding the initiation of ART in patients with similar presentations and the role played by the following factors in the development and clinical outcome of SJS/TEN: HIV infection, CD4+ count, causative drug, age, gender and use of steroids during the acute stages. This case emphasises the need for further research into these factors to aid clinicians in decision-making when it comes to safe options for HIV-associated mania.